Police are investigating a possible arson at a mosque in Escondido. 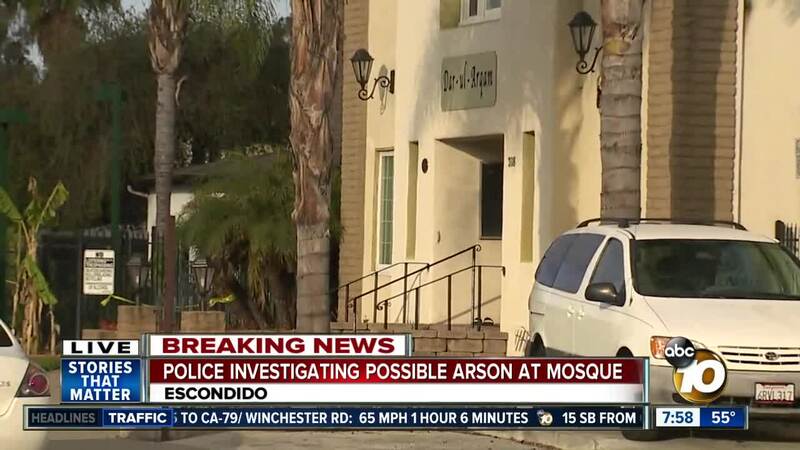 ESCONDIDO, Calif. (KGTV) -- Graffiti referencing the New Zealand mass shooting that left 50 people dead was discovered at the scene of a possible arson at an Escondido mosque early Sunday morning. According to police, the fire started around 3:30 a.m. at the Islamic Center of Escondido located near the intersection of 6th Avenue and Escondido Boulevard. Police believe members of the mosque were able to extinguish the flames before firefighters arrived. Seven people were inside when the fire was reportedly set. No one was injured and minimal damage was done to the building, according to police. According to police, graffiti left behind by the suspect made reference to the mass shooting in New Zealand, though details on the graffiti weren't available. Police tell 10News they are investigating the incident as attempted arson and a possible hate crime. No suspects have been identified at this time. Following the fire, members of the mosque scheduled an interfaith prayer vigil. The event will be held at 8 p.m. Sunday at the Islamic Center of Escondido. "Once again, we will stand together in love and prayer as we show our unified support for the members of this local Mosque and for the Muslim community at large. All are welcome to attend," the mosque said in a news release. A little more than a week after 50 Muslim worshippers in New Zealand were brutally massacred at the hands of a white supremacist terrorist who cited Donald Trump in his hate manifesto, that same hatred has resurfaced in Escondido. It is disturbing enough that some sick individual would attempt to burn a house of worship to the ground, but referencing the slayings in New Zealand is beyond the pale. While the majority of humanity has responded to the tragedy to draw closer to one another and refute hatred, a violent and hate-filled minority seeks further divisions. We are grateful that someone was inside the mosque and was able to act quickly to put the fire out. We ask anyone with information to come forward and contact the Escondido Police Department. We stand in solidarity with our community members who attend the Islamic Center of Escondido.